I usually grow Millionaire eggplant in a big bucket next to my containerized tomatoes and it does well. 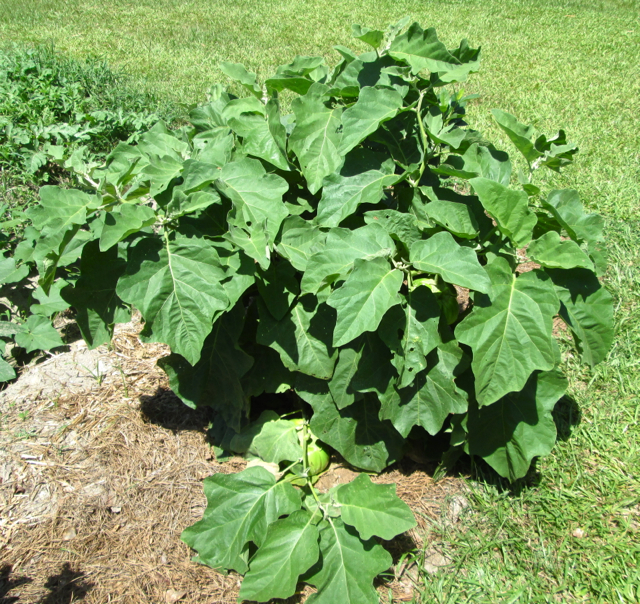 One plant is usually enough to prevent 'eggplant overload'. But last year I decided on trying Cambodian Green Giant as well, just as a toy. One plant. It's a good thing. It was planted in the ground down near the potato bed and although it's a slow grower, that thing really is huge! The plant ended up about 5' in diameter before it was all over. There's an eggplant peeking out from under the leaves at the bottom of the pic. The fruits themselves were also huge and it made a lot of them. So mucgh for avoiding eggplant overload!. This was the largest one and weighed 2 lb 3 oz. I did discover though that each of those vertical lobes contains a large, long seed cavities in them. Each is about 1/2" wide and packed with seeds top to bottom so it's best to slice this thing horizontally where the seeds appear in penny-sized spots around the center rather than long streaks that require scraping out. The flavor is good and it's really solid, making for good grilling. And it freezes well for later casseroles. If anyone decides to play with this one, be sure to give it plenty of elbow room! And yes, I will "play" with another one this year. Friends liked getting the excess. Nice info about one I'd not heard much about, GoDawgs. That's a beautiful plant! 8 of 9 varieties have germinated for me so far; here's hoping they'll grow healthy and strong like yours! OMG! Yesterday I realized that I made a HUGE mistake. I was watering this year's "Cambodian Giant" eggplant and all of a sudden it hit me like a ton of bricks. It's not an eggplant... it's a big broccoli! Talk about feeling totally stupid! Geez! It was started the same time as the broccoli and cabbage plants. I must have seeded the broccoli packs and then mindlessly put some of that seed in the eggplant pot too. Its container was labeled eggplant. 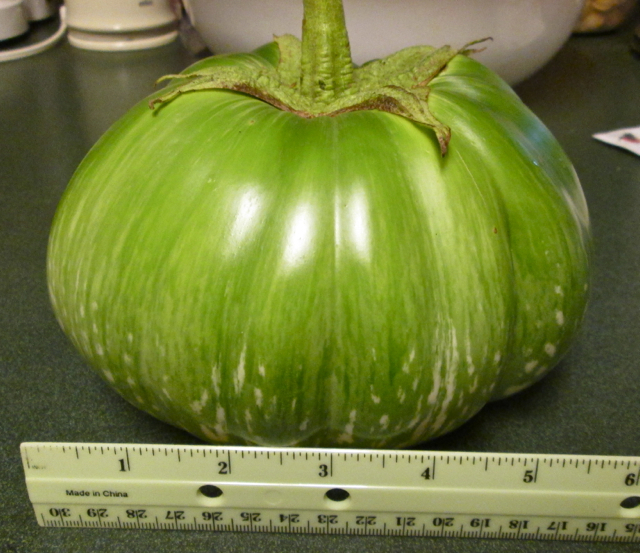 It was planted out as an eggplant and labeled as such. DUH! It's now 2' tall and I never noticed until yesterday it wasn't an eggplant, just that it's been growing slower than eggplant usually does. And yes, there's a small broccoli button forming down in the leaves. It just goes to prove that if you believe something strongly enough, nothing can change your mind until one day the truth just smacks you right up the side of the head. I think there's a life lesson there. That looks really nice. Have you grown any of the long green ones (like Thailand long green)? How does it compare? I've tried the long purple ones like Pingtung and Ichiban but never the green ones. I might have to try that next year. I usually grow Millionaire and have one going this year too. The Cambodian is probably more firm and definitely has larger seed cavities. The taste is pretty much the same, I guess. To me, eggplant is pretty much eggplant but then I've never tasted them side by side.